born on may 4, 1963, in the village of presnovka, Sokolovsky district, North Kazakhstan region, in a family of employees. In 1970 he went to school, in 1980 he graduated from 10 classes. From 1981 to 1983 he served in The Soviet Army. In 1983 he entered the preparatory Department of Karaganda pedagogical Institute. 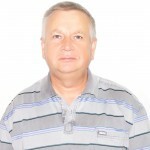 In 1984 he was enrolled as a student of Karaganda pedagogical Institute at the faculty of the head of military training and physical education. In 1987 he won. In 2013, he served in the office of the headquarters of the commander of the regional command “Astana” as a senior officer (inspector) in emergency situations. In August 2013, he was dismissed due to retirement. 1 Sep 2013 accepted excuse to Kar GTU. - II, III degree “for service without education”.